Here you can discover, visualize and download European greenhouse gas data! ICOS is the Integrated Carbon Observation System, a European Research Infrastructure. ICOS is the European measurement system for high quality and high precision greenhouse gas observations. The ICOS Carbon Portal provides free and open access to all ICOS data. ICOS data supports climate science that informs scientists and society on natural and human emissions and uptake of these greenhouse gases from ocean, land ecosystems and atmosphere. Climate change is recognized by the United Nations and the European Union as the biggest environmental threat to human civilisation. Greenhouse gas emissions by humans are recognized as the most important contribution to the global warming since the industrial revolution we now witness (currently about 1 degree Celsius). 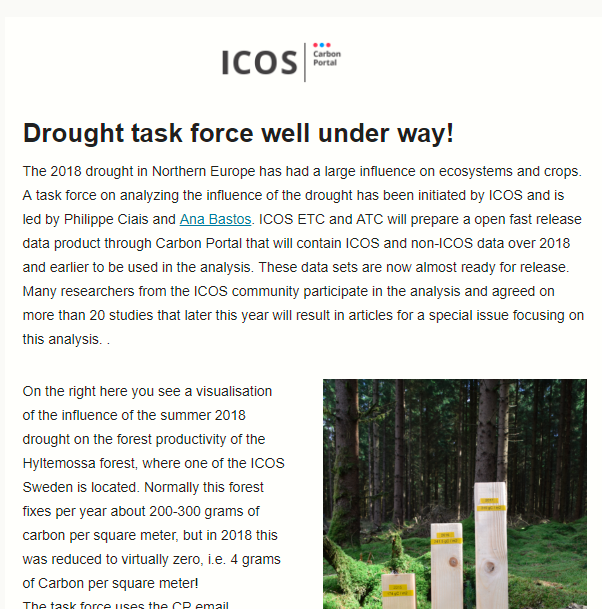 ICOS data informs us on the extremely uncertain changes in natural fluxes due to ongoing climate change (feedbacks) and whether the mitigation promises from the Paris agreement translate in actual reductions in the increase of greenhouse gases in the atmosphere. 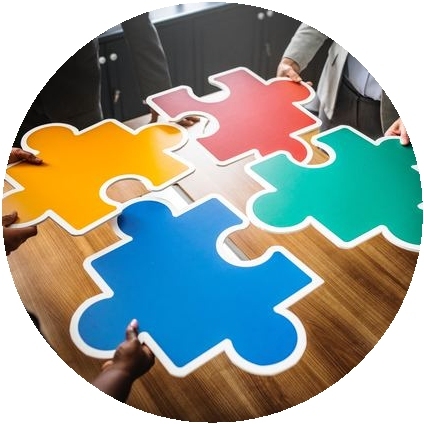 In the Carbon Portal you will find data from over 130 stations and get access to the data processed by the Thematic Centers as raw, near real time and final quality-controlled data, supplemented with elaborated (model) data and analyses. By the end of 2019 all stations will be in full operation. Until then this portal will gradually be filled with more data and services. popular-scientific products for policy makers, authorities, teachers and students. 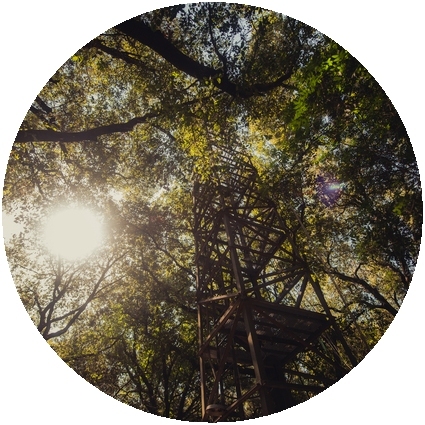 ICOS Carbon Portal is part of the Integrated Carbon Observation System European Research Infrastructure Consortium (ICOS ERIC), that coordinates and integrates the ICOS-RI. ICOS carbon Portal is hosted by Sweden with contribution from the Netherlands. The overall aim of the ICOS RI is to establish a long-term greenhouse gas observation system in Europe supporting high-quality climate change research and providing access to research data. The goal? To promote fundamental understanding of the carbon cycle and greenhouse gas budgets, as well as the processes underlying perturbations. Carbon Portal participates in several other pan-European cooperations, among others ENVRI plus – a Horizon 2020 project, EOSC-Hub – to contribute to the EOSC implementation enabling seamless and open access to a system of research data and services, and RINGO – a project delivering a coordinated approach for the identification and assessment of needs, gaps and overlaps for strategic aviation research infrastructures. CO2 for a short period in summer 2017 from stations Zeppelin, Hyytiälä and OPE. On 24 August 2018 ICOS ATC released an update of the Level 2 ICOS data for atmospheric stations! Level 2 data is final and fully quality controlled observational data. The new dataset contains data over 2016 to 2018 from all 11 atmosphere stations labelled in November 2017 and provides hourly averaged mole fractions of CO2, CH4 and CO, meteorological observations and two weekly integrated samples of 14CO2. The data can be browsed and downloaded from the Carbon Portal app by using this pre-configured search link. You can also download the complete dataset from the collection landing page . Colomb, A., Conil, S., Delmotte, M., Heliasz, M., Hermannsen, O., Holst, J., Keronen, P., Komínková, K., Kubistin, D., Laurent, O., Lehner, I., Levula, J., Lindauer, M., Lunder, C., Lund Myhre, C., Marek, M., Marklund, P., Mölder, M., Ottosson Löfvenius, M., Pichon, J.-M., Plaß-Dûlmer, C., Ramonet, M., Schumacher, M., Steinbacher, M., Vítková, G., Weyrauch, D. and Yver-Kwok, C.: ICOS Atmospheric Greenhouse Gas Mole Fractions of CO2, CH4, CO, 14CO2 and Meteorological Observations 2016-2018, final quality controlled Level 2 data, , doi:10.18160/rhkc-vp22, 2018. Some good news from ICOS Carbon Portal. ICOS Carbon Portal is hiring: two open positions. Apply before 23 April!